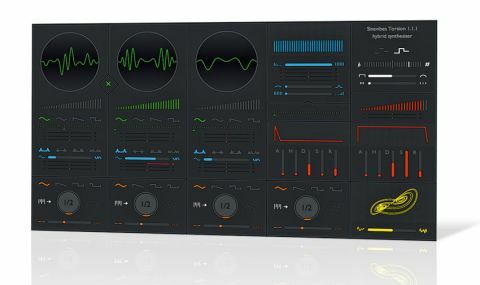 A triple-oscillator hybrid synth with an easy interface and lots of modulation sources, Torsion is an excellent oddity. Easy to use. Versatile oscillators for complex sounds. Chaos oscillator gives interesting results. Plentiful modulation capabilities. Inexpensive. No noise generator. LFOs locked to host tempo. Take a look at that screenshot. As beautifully designed as it is, to the experienced computer musician, it positively screams, "I'm your typical virtual analogue synth!" But looks can be deceptive, and to take Sinevibes' Torsion at face value would be to miss an instrument capable of producing sounds that go far beyond the realm of Minimoog-esque tones. "Torsion's three oscillators aren't bog-standard analogues. They're additive in nature, featuring a waveshaping element that 'curls' the waveform"
Torsion's three oscillators aren't bog-standard analogues. Sure, you can choose from the usual sine, saw, triangle and square waves, but these oscillators are actually additive in nature and feature an unusual waveshaping element that 'curls' the waveform to produce waves of considerable complexity. Warm, thick analogue tones are possible (even if they are all slightly affected by the Waveshaper circuit), but so are spiky, gritty digital waves that you'd expect from an instrument with "DX" or "PPG" in the name. The Waveshape section offers four different models from which to choose, each providing a significantly different effect. The blue Amount slider determines exactly how much effect the waveshaper has on the oscillator's waveform. There's also a ring modulator that can be used to multiply Oscillator 2's output by that of Oscillator 1 for inharmonic, clangourous tones. Torsion's filter section features a familiar 4-pole resonant low-pass, followed by a non-resonant 12dB high-pass. Alas, the former doesn't self-oscillate, but you do get a fourth audio-rate oscillator that can be used to modulate the filter cutoff for gritty, aggressive sounds. It also does a fine line in noise, which goes some way towards making up for Torsion's lack of a dedicated noise generator. "Each mod source section is assigned a colour, with sliders coloured to match, making it very easy to tell what's modulating what and by how much"
Further modulation comes from four LFOs. Three of them are dedicated to an oscillator each, while the fourth is tethered to both the filter cutoff and the output amplifier. The usual waveshapes are here, along with a Random function. The LFOs are always locked to the host's tempo, and their Rate can be set from 1/64 to four bars. Key sync is also available for each LFO, restarting the cycle with each keypress when activated. Yet more modulation is provided by two five-stage envelope generators, one assigned to the amp, the other assignable to the oscillators or filter. Three MIDI mod sources are also hardwired to specific targets: velocity to amp and filter cutoff, note pitch to cutoff, and mod wheel to the pitch modulation depth. Each mod source section is assigned a colour, with the various depth sliders coloured to match, making it very easy to tell what's modulating what and by how much. It's a great system, and only the greenest of synthesists will need to consult the rather short (but direct) online manual. Torsion has a lot going for it and comes in at a reasonable price. There are some obvious omissions (noise generator, free-spinning LFOs, self-oscillating filter), but they'd up its complexity - and perhaps in turn its price - so we can appreciate this design decision. Sinevibes doesn't support any format other than Audio Units for Mac, so its customer base is necessarily limited, but those who give Torsion a shot will find a quick, easy source of sounds that sit just outside the norm. It's pretty simple, but it's no standard VA. Sure, it can do punchy basses and resonant sweeps, but it's the spiky digital timbres that give it its edge.